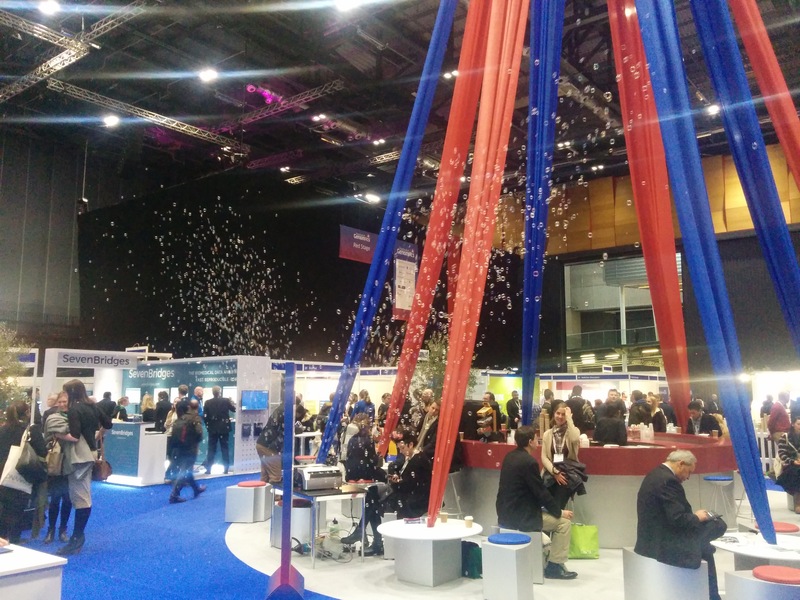 Yesterday the Seven Bridges team were among the hundreds of delegates who braved the Docklands chill to attend day one of the Festival of Genomics London. The Festival is the home leg of the series operated by Front Line Genomics, the London-based events–publisher focused on delivering genomics to health care. The festival format is akin to a series of plenary talks wrapped around a trade show. There are plenty of tables to loiter at, a bustling exhibit hall, and seemingly plenty of conversations. It’s refreshing to attend an event where the presentations and conversations are intentionally big-picture. Gil McVean from the Oxford Big Data Institute chaired an all-day stream on ‘Enabling Data’. He highlighted the necessity of very large datasets (i.e. 500,000+ data points) for biomedical research. In fact, many of the major challenges in the next decade are about scale. Such large datasets are starting to be collected, such as in the 100,000 Genomes Project, UK Biobank, and Million Veteran Program. In fact, genomic data is relatively easy to collect; a far bigger challenge will be integrating it with phenotypic and big data. Niklas Blomberg, Director of ELIXIR, spoke about the challenges of creating a pan-European network for data sharing. Europe has ~500,000 life science researchers, who generate a lot of data. ELIXIR is an international distributed infrastructure comprising around 130 major bioinformatics service providers and institutes in almost 20 member and observer nations. It partners with the Global Alliance for Genomics and Health (GA4GH) to provide consent-based access to genomic data via GA4GH Beacons. Richard Durbin from the Wellcome Trust Sanger Institute spoke about genome reference structures, including graph genomes. Sequence data is large and grows with each additional sample. Unfortunately each new sequence is less and less novel. Reference genomes are important, but new types of reference are needed. Graph genomes, like the one we’re developing for Genomics England, offer a solution to some of the problems of conventional linear reference structures. UK genomics took center stage in the program. The nation’s political life sciences royalty arrived as speakers, including George Freeman (the UK’s first Minister for Life Sciences), Dame Sally Davies (Chief Medical Officer) and Sir John Chisholm (Executive Chair of Genomics England). George Freeman made the big announcements of the morning plenary session, with £50m funding per year for the next 5 years and the first patients with cancer recruited to the 100,000 Genomes Project. Both John Chisholm and Sally Davies highlighted the need for Genomics England to engage with industry and the private sector in order to deliver on the promise of genomics for health care. Having last week moved Seven Bridges UK into our expanded London offices, we consider ourselves firmly part of the landscape of genomics in the UK. The plenary speakers also consistently highlighted the importance of obtaining and maintaining public buy-in to such large-scale projects. Aside from the politicos, around 50 exhibitors were in attendance, including the Seven Bridges team, who spent the day running demos at our swish-looking stand. If you didn’t yet manage to say hello, make sure you drop by today. We’ll give you a quick tour of the cool stuff we make. This morning, Julia Fan Li from our UK office will close the morning plenary session in style, talking about Discovery in Millions of Genomes. Grab coffee and be there at 9:30am to learn about our experience of working with the largest genomic datasets in the world today.